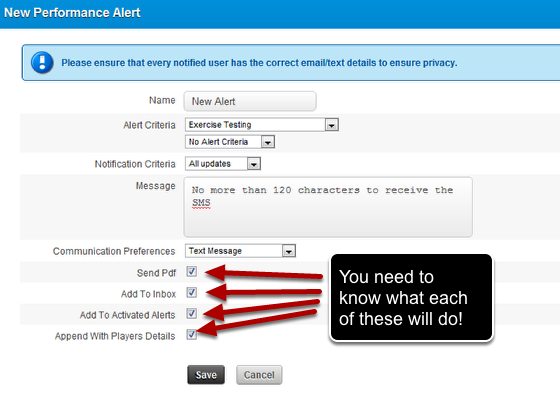 If you have set up the alert criteria, you need to specify WHEN you want to be notified of this alert. Notification Criteria allow you to choose when you want to be notified. Changes only: means you will receive an alert when the form has any changes made to it. E.g when a form has additional information added to it like SOAP notes being added into an injury form. -It won't alert you if the record is opened and then saved and closed with no actual changes occurring to the entered data. First save only: means you will receive an alert ONLY when the record is first saved in Smartabase. Changes After First Save: means you will receive an alert ONLY AFTER the entry has been saved in Smartabase. Changed From: allows you to be notified when a change occurs in one of the variables e.g. when a change occurs in injury status (as outlined in the step below). To set this up you need to set up additional "Changed From" criteria (as shown in the image two steps below. This is normally set up for Injury or Illness Event Forms. N.B. Changes After First Save is almost identical to Changes Only, but there is a subtle difference in that Changes Only will trigger on any save but the first one, while Changes After First Save does not trigger when going from draft to save - so it will trigger on any save after the save that sets the event to be "active" (this is the old save as draft behaviour, not new scheduling stuff). 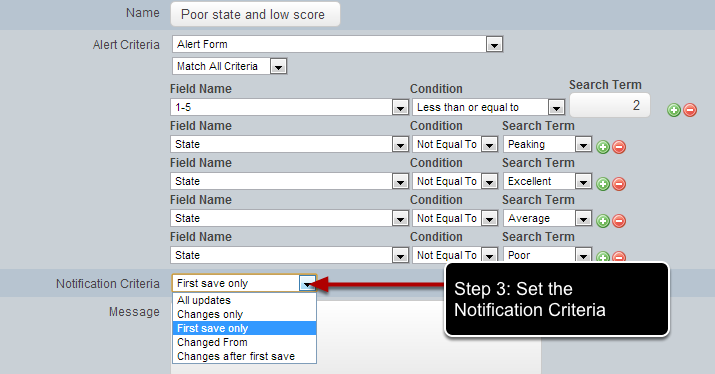 #1: Set up the Alert Criteria that you want to be notified of (e.g when an athlete is fully available, or in the example here fully ok). N.B. You MUST set this up first before you set up the changed from notification. #3: Add in the Changed From criteria select if Match All or Match Any to suit your needs. Then click the green + button and select the criteria that you want to be notified of when the athlete changes from this criteria. Set up the the Field Name, the Condition and the Search Term just as you would for the alert criteria. Recheck your logic to ensure that you have set it up correctly. The Alert that you want to be notified of is when status is Equal to fully ok, but you ONLY want to be notified of this if the field status has changed from poor or terrible. Step 4: Write in the message that you want the notified users to receive. You must enter a message or the alert will NOT work. This message will appear in the notified alerts list and with all of the alerts that are sent. Please enter an appropriate and accurate message based on your communication preferences. N.B. If the message is going to be sent via SMS, or E-mail, you could consider adding in "Do Not Reply" into the message content so users do not try and reply to the e-mail or SMS directly. Also, consider how the message fits with your organisation's restrictions on personal information being sent out of the system. Note, if you send an SMS you will ONLY have 140 characters available for the message. Try and be very succinct! It is CRUCIAL that you consider what information is being sent in the message, especially if it is sent via e-mail or SMS. If you write in that an athlete has had a new injury and it set up in the communication preferences to be sent via e-mail, which is NOT encrypted, then you may want to limit the specifics of the message. 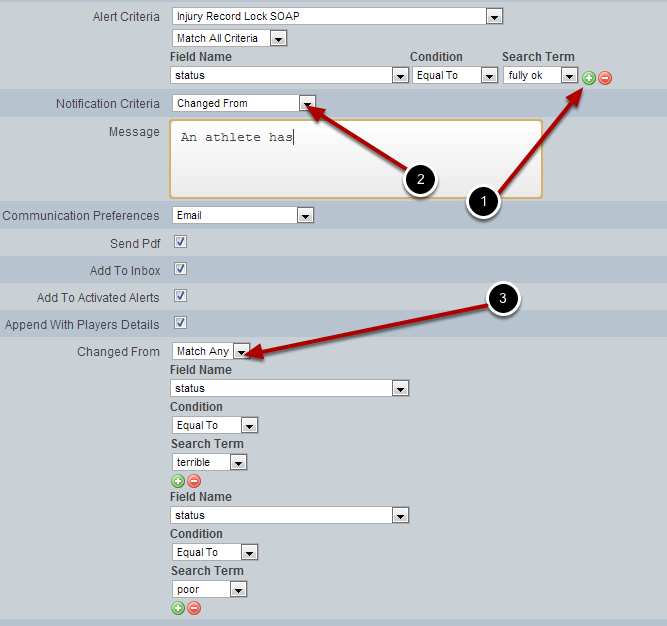 Just ensure that what ever content you are sending, you are sure it meets the organisations security needs- especially if you use the attach PDF and append the athlete's name as this means the alert, the athlete's name AND an attachment of the record are showing IN THE SAME MESSAGE (See the next steps for more on communication preferences). Additional criteria for attaching a PDF, the Activated Alerts, the Inbox and Player Details can be completely customised. Please see the next lesson for important information about these features and about consider the correct use for each feature. NOTE: If the notification criteria is set to All Updates and linked information is updated in a form that links into the form being monitored, this will NOT fire off alerts again. The form being monitored MUST be openened and saved manually (e.g., NOT via a resave, or an update to an linked form or a linked field) so the alert is prompted by a Smartabase user saving the record.